The Golden Barrow or Upton Lovell G2e was near the River Wylye, slightly South West of Stonehenge. Since its excavation in 1803, it has been destroyed. This barrow contained as many costly and interesting treasures as the Bush Barrow. There was more than one cremation found in this barrow, but the treasures only seem to have been with one person. It isn’t known whether this was a man or a woman, since necklaces may have been worn by anyone. On the other hand, the Wessex lord in the Bush Barrow had no necklaces with him, nor did the Amesbury Archer, nor his family member, who may have been his son. He also had gold ‘hair tresses’. Perhaps this particular person was a woman. William Cunnington had the following to say about this barrow. William Cunnington was a wee bit off with his dates, since it is now thought that the cremation dates 1900-1600 BCE, but like Bush Barrow, it could be older. The gold artefacts from both barrows do look as if the same person made them. At the Wiltshire Heritage Museum, the bronze lance head is listed as a knife dagger, and the bronze pin is listed as an awl. The above amber and shale beads are believed to have been a necklace. 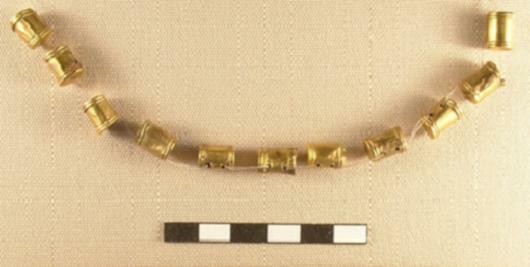 The gold beads, which were drum shaped, approximately 1/2 an inch long, had ends which could be screwed off, they were small containers, and could be opened even while being worn, perhaps as part of a bracelet, with the gold button used as a fastener. The button would have been on the outside of the arm. This fancy button is gold foil over shale, named a Bulla by William Cunnington, and has holes drilled in a shallow V shape in the bottom. The measurements given for the gold cover are 47 mm in diameter and 43 mm in height. Gold Button showing top and underside How the bracelet may have looked and the method of tying it together. Once the ends of the cord went through the button, it wouldn’t have to be removed again. It would be untied and loosened when removing it from your arm, but the end of the cord would stay through both holes. 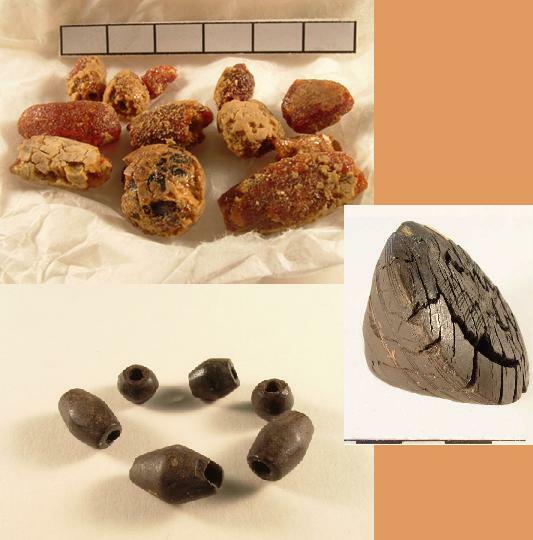 These ends may have been decorated with long hair from a cow’s tail, feathers or perhaps some of the amber beads which were found. Bracelets of this general form were commonly seen on the carvings of rulers from Sumer, Babylon, and Assyria. The ones from the area of the Fertile Crescent, usually had a flower on them. The button has the same triangle or zigzag decoration as was found on the large gold lozenge from the Bush Barrow. But the button has an extra surprise. On the bottom the design is the same as the central part of the Clandon Barrow lozenge, which was another device connected to mathematical coding as shown by Martin Doutré. This lozenge must also have been made by the same person. These mathematical codes were quite complicated, and were connected to astronomy, surveying, navigation, calendar keeping, weights, measures and volumes. The various articles which were inscribed with these codes, would have been used as memory devices. A question from a fellow blogger, made me investigate the Rillaton and Ringlemere cups a little closer. These were found at two different places and not with the Golden Barrow treasure. The Rillaton cup (left) is 9 cm high, and the Ringlemere cup (right) is 11 cm high. One of my measuring cups looks to be about the same size as the Rillaton cup, only a little taller. 9 cm up the side of my cup gives me one pint. These cups may not have been for drinking beverages, instead they may have been measuring cups for some other purpose. The Ringlemere cup may have a pint capacity at the top of the corrugations, and perhaps another measurement when full. It may have held three cups when full. The corrugations likely indicated different measures, both dry and liquid. A pint is an interesting measure since it can be found in both dry and liquid Imperial measure. Liquid measure: 4 gills = 1 pint; 2 pints = 1 quart; 4 quarts = 1 gallon; 1 gallon = 231 cubic inches. Dry measure: 2 pints = 1 quart; 8 quarts = 1 peck; 4 pecks = 1 bushel; 10 pecks or 2 1/2 bushels = 1 barrel; 1 bushel = 2150.42 cubic inches. Thinking of the other mathematical codes found in the other gold objects, makes me wonder what measurements could be found in each groove of the corrugations. I don’t suppose the British Museum would allow me to conduct an investigation, unfortunately. The handles on these cups are held to the body by lozenge-shaped rivets. The way they are attached makes them look like small Squares of Enlightenment. 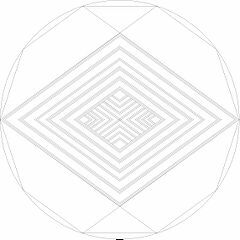 These lozenges, zigzags, and triangles are all little signatures of a highly evolved system of weights and measures. All these systems stem from astronomy, and do seem to have been around for thousands of years before we see the proof of such things in the UK and Ireland. However, these people may have used wood, stone, pottery or some other material for their original measuring devices. A piece of simple cord could have had knots tied in it at the appropriate places. It would be small, light and easy to carry around, but such things in the UK and Ireland would have decayed long ago. It’s obvious that whoever made these gold artefacts, had some sort of measuring device, and knew all the mathematical coding. The people using them would also have understood the coding, which means that we are looking at some very well educated people. The mathematics involved are really quite astounding. Because these artefacts do all seem to be connected to measures of all sorts, based originally on the circumference of the Earth, it is quite possible that the cups, the Clandon Barrow treasure, the Bush Barrow Treasure, and the Golden Barrow treasure were all made by the same craftsman. I don’t imagine there were that many goldsmiths running about in those days who would have all this knowledge. In ancient times smiths were considered holy because they used the four ancient elements of Earth, Air, Fire and Water to make their artistic creations. In Egypt they were a priesthood, they were the magicians who could turn a solid substance into a liquid, and then reshape the hardened metal into whatever shape they wanted. The biggest percentage of the population would still have been using stone tools, so these ‘ornaments’ must have been mind-boggling for anyone who saw them. The Amesbury Archer being the foremost candidate as craftsman, since he had the gold ‘hair tresses’, the metal working kit, and the ‘wrist guards’ which were actually measuring devices. Perhaps the hair tresses were a sign of their profession. Getting back to these interesting gold beads, they had me wondering what was kept in the containers. What were they for? What use did they have? They were strung together through two holes in the sides rather than two holes through the ends, which would have made it possible to separate one from its companions to be able to undo one of the lids, but why? I had several thoughts about this. Perhaps special powders were kept in them for creating green smoke, red smoke or sparkles when applied to a fire. Done on the sly of course, the peasants wouldn’t have known that there were special powders hiding in the bracelet. Such things were generally done after dark, so the only light may have been the fire. But then I thought perhaps this person was keeping track of different women’s pregnancies. One container per person, and after each month went by, you would add a grain seed or perhaps a small piece of gravel. Questions would have been asked to determine which phase of the Moon, and how long ago this person thought they became pregnant. However, it is also possible that they were keeping track of different weights belonging to various systems. Wheat seeds were once at the root of weight measures. This is why we still have, grains, as a weight measure. Among the Hebrew desert weight (light) measures can be found 131.25 grains. Having some wheat seed on hand, I did a little experiment. 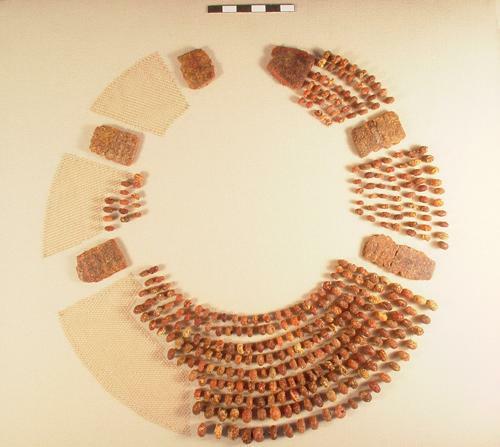 Each one of these gold containers could hold 12 wheat seeds, making a total of 132 if all the containers held 12 each. This bracelet now becomes a great deal more than just jewellery. The button likely had measures in its size and decorations. Drawing a triangle with base 47 cm and height 43 cm, pretty much gives you an equilateral triangle. The central mathematical codes of the Clandon Barrow lozenge are also on the bottom of the button. Considering what else has been discovered, coloured smoke seems rather lame. But who knows? These people were into dual purpose things. The next piece is a gold plaque 144 mm by 68 mm, according to the Wiltshire Heritage Museum. It once had a wood back as did the two large gold lozenges. I’ve been stringing lines on it out of curiosity. The large lozenge has angles of 80° and 100°, these are the same as the large gold lozenge from the Bush Barrow. This area may have been connected to Solar/Lunar measurements. The tiny lozenges in the net at each end of the plaque have angles of 60° and 120°, which is what the small gold lozenge from the Bush Barrow had. This net is reminiscent of the lozenges I strung across England, which had to do with surveying. As a final bonus it has cording around the edge, the measuring cord. If the museum’s measurements are correct, then the circumference of the plaque would be 424 mm or 42.4 cm. 10 cm = 4 inches. So the circumference would be 16.96 inches. Dividing 16.96 by the magic number of hidden secrets, 4, I get 4.24 inches, which is a reflection and progression of 424 mm and 42.4 cm. This is the magic of metrology, all numbers in all systems are interconnected, having stemmed from one source, the Great Pyramid, which many consider to be much older than Khufu, who is supposed to have had it built. Although I am not a mathematician, I’d say this gold plaque is likely full of mathematical coding, just like the gold lozenges. Seems these gold artefacts were more than mere jewellery, they were memory devices covering a wide range of measurements of all types. Being made of gold, they wouldn’t rot, their hidden knowledge has been there all the time, but few people have recognized their significance, thinking of them just as ornaments instead. Considering their function, they may be much older than Bush Barrow or Golden Barrow. They could well have been heirlooms when they were finally buried, possibly dating back to before 2300 BCE. These articles may have been the ‘gold standard’, literally, of measurements in England at that time. They may have been used by the elite to keep an eye on the merchants’ measures, to make sure they were not short-changing the common folk. The Bell Beakers may have become so popular because they may have held a certain capacity or capacities, and became a common man’s measuring device all over Europe. Two conical bosses and two flat pommels were found also. These were first interpreted by Sir Richard Colt-Hoare as small boxes, but William Cunnington found them several inches apart, suggesting they were the ends of two wooden sceptres. Unfortunately it doesn’t tell us how long these sceptres may have been. They may have been measuring rods, rather than just sceptres. This would be in keeping with the other measuring devices. This last piece is quite fascinating. 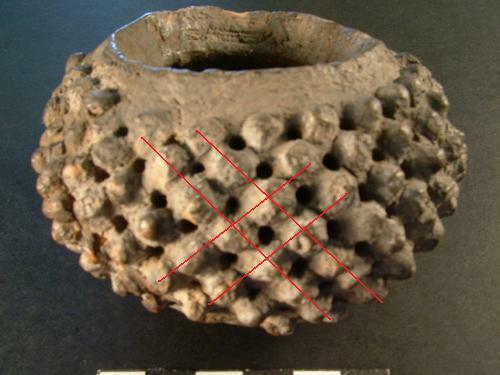 It is thought to have been an incense burner. Although several incense burners have been found in various barrows, this one is unique. There are 108 small knobs, which seem to have been applied to the pottery one by one. There were holes drilled into the pottery between these nodules. It’s rather made like a net. All in all, these treasures are quite amazing, particularly all the mathematical coding found in these pieces. They must have been incredibly costly at that stage in history. Such gold instruments would be extremely costly now, even the lunula shaped amber necklace would cost a fortune today. Who were the people who owned these items? Have we stumbled upon the people named the Tuatha Danann? Were they the people of the goddess Anu, D’Anu, or should that be the god Anu, or his wife Antu? The Abantu of South Africa are Ab Antu, the children of Antu. D’Anu in Sumerian would mean, of Anu. This puts us back with Anu’s White Temple and Inanna’s Temple in Uruk. The artefacts from England that we have been looking at had the same design elements as the cone mosaics at Inanna’s Temple. It’s all those names, Danann, Manannan, Inanna. The earliest form of Bran the Blessed’s name was Uran, which became Vran, and then Bran. Uran from Ur or Uruk? I am not through investigating these gold artefacts, and am making further enquiries regarding these. I will post my findings at a later date……….I hope. For anyone interested in the mathematics which has been found at Stonehenge and on the Bush Barrow and Clandon Barrow lozenges, see Martin Doutré’s work at Ancient Celtic New Zealand, and D. P. Gregg’s, The Stonehenge Codes, which is in PDF form, so you can download it and read it at your leisure, it will take a while. For other measurements of various landmarks, megaliths, and ancient constructions in many countries, see Ancient-wisdom.co.uk. This is an excellent site with clear concise facts and plenty of detail and great pictures. Wiltshire Heritage Museum, articles and pictures of the Golden Barrow treasures, listed as Upton Lovell G2e. Drawing of the Clandon Barrow lozenge construction method, Anthony Johnson, at Wikipedia entitled Clandon Barrow. This entry was posted in Ancient History, archaeology, Bronze Age artefacts and tagged amber, gold artefacts, mathematics, science, Tuatha Danann, weights and measures. An interesting article. The burial of a priest/priestess? Thanks Alex, glad you enjoyed it. Definitely, priest/priestess. Mistress or Master of Measures. Very well educated, that’s for sure. The mathematics connected to all the gold artefacts is mind boggling. Very interesting indeed…the grave is almost certainly that of an elite member of society. The pyramidal or diamond shaped symbol is actually a depiction of the star constellation, the Southern Cross. Andean cultures also used this as an important symbol and you will find very similar dimensions to the ones you mention in your article. In South America, it is known as The Andean Cross. The ancients had a very profound understanding of astronomy and mathematics and the knowledge is found in common themes in ancient stonework all over the planet. This suggests they travelled far and wide long before history tell us they did, and/or there was an advanced civilisation that shared this common knowledge but then spread out over the world after the deluge – the Atlantis “myth” perhaps. Either way mainstream history is wrong, wrong and wrong again. Thank you for your very interesting comment. The Southern Cross ties it to navigators………again. That is what I seem to be hunting, those astronomer, surveyor, navigators. There does seem to have been a great deal of knowledge about those things a very long time ago if the maps Charles Hapgood analyzed are anything to go by. In pre history. And these people do seem to have spread it all around. Will read your article, sounds interesting.